Communication Disorders (CD) is one of four majors in the Department of Special Education, which is in the College of Education. There are approximately 150 graduate and undergraduate students enrolled in CD. We are housed in a modern facility, centrally located on campus. 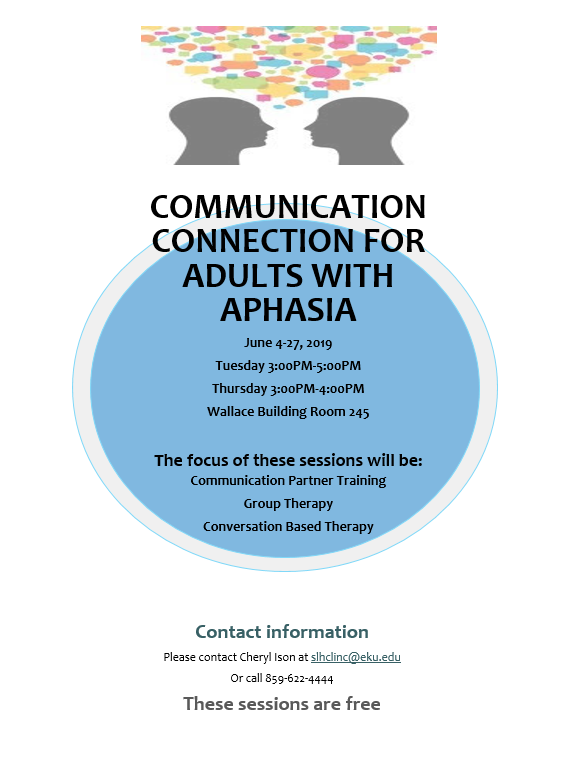 Our Program is accredited by ASHA's Council on Academic Accreditation. Bachelor's and Master's degrees are offered. For an undergraduate student, the 123-129-hour Bachelor of Science degree includes "pre-professional" coursework in speech-language pathology that is prerequisite to the graduate level of study at EKU, but does not provide eligibility for state or national certification. Upon completion of the 63-hour Master of Arts degree, the graduate is eligible to pursue professional certification in speech-language pathology at the state and national levels and licensure at the state level. 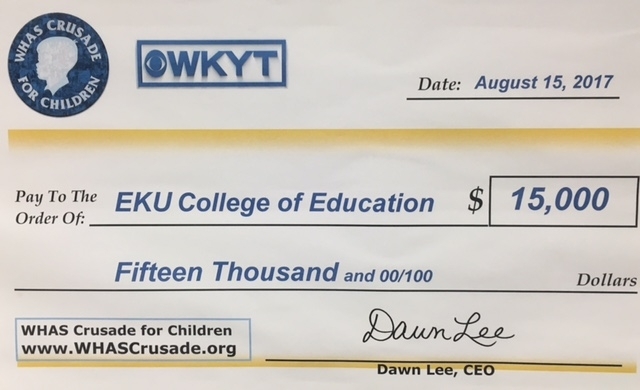 The 63-hour graduate program will also provide eligibility for a Rank I certification endorsement from the Kentucky Department of Education. Any student who is admitted to EKU may declare this major. The student will be assigned to a program advisor and will be classified as a "Pre-CD" major. However, having a Pre-CD status does not guarantee admission into the CD undergraduate program. Pre-CD majors will be restricted to enrollment in the following major CDS courses: CDS 275 and 360. 40 semester credit hours completed --Examples of hours "not completed" may be those from which the student withdrew ("W"), received an incomplete ("I" or "IP"), or did not pass ("F" or "U"). Hours must be based on 100-level courses or higher. Developmental or remedial courses such as those numbered 090, 093, and 095 (or equivalent transfer courses) cannot be counted in the 40 hours nor in the GPA. GPA of 3.0 overall (on a 4.0 scale) for the 40 semester credit hours completed. Once admitted to the CD program, the student must earn a grade of "C" or higher in CDS 275 "Introduction to Communication Disorders" or equivalent transfer course before registering for any CDS courses in the major requirements. Information regarding admission to Eastern Kentucky University, tuition, financial aid, and housing may be obtained through the Division of Admissions. An application form for admission to EKU may be obtained at the following link. This is an application for admission to EKU, not the application for admission to the CD undergraduate program. A CD application form may be obtained as described below. The GPA X ACT determines a rank order for those applying. The CD Program will admit 30 new undergraduate students each year to enter the Junior-level CDS course sequence. Admission will apply to all students equally, whether they are enrolled at EKU or transfer to EKU. Transfer students do not have to be enrolled in university courses at the time of submitting an application. It should be noted that admission of transfer students, who have been enrolled in a speech-language pathology program elsewhere, will be determined on a case-by-case basis depending on the program level (Junior or Senior) they should enter at EKU and the ability of the CD Program to accommodate their admission at that time. Applicants will be notified within approximately four weeks from the admission date. A letter of admission status will be sent to all applicants by Dr. Charlotte Hubbard, Program Coordinator. The required curriculum for the undergraduate communication disorders program may be obtained through the Department of Special Education Office in Wallace 245 (phone 859-622-4442) or may be obtained online by clicking on the following links.